Aim: Reducing the psychosocial stress by various methods can improve overall health, and yoga is now considered as an easily available alternative method. The present cross-sectional pilot study was conducted mainly to find the association of yoga practice with periodontal disease by measuring serum cortisol levels. Materials and Methods: A total of 70 subjects with age range of 35—60 years suffering with chronic periodontitis were divided into group I (with stress), group II (without stress), and group III (practicing yoga). Psychological evaluation was carried out using Hamilton Anxiety Rating Scale (HAM-A) and Zung Self-rating Depression Scale (ZSDS). Periodontal parameters like plaque index (PI), probing pocket depth (PPD), and clinical attachment level (CAL) at 5—8 mm and >8 mm were recorded. Blood samples were collected and serum cortisol levels were measured. Results: Mean age, plaque scores, and number of teeth with PPD and CAL at 5—8 mm and >8 mm were similar in all the groups, except between group I and group III where a multiple comparison with Tukey's post-hoc test showed significant difference in plaque index (P < 0.038) and the number of teeth with CAL 5—8 mm (P < 0.016). Serum cortisol levels and HAM-A scale and ZSDS scores showed highly significant value (P < 0.001) in group I subjects when compared with group II and group III subjects. Conclusion: Cross-sectional observation done among three groups showed that individuals practicing yoga regularly had low serum cortisol levels, HAM-A scale and ZSDS scores, and better periodontal health. Background: The surface of an implantable biomaterial plays a very important role in determining the biocompatibility, osteoinduction, and osteointegration of implants because it is in intimate contact with the host bone and soft tissues. Objective: This study was aimed to assess the effect of plasma surface treatment on the bioactivity of titanium alloy (Ti—6Al—4V). Materials and Methods: Fifteen titanium alloy samples were used in this study. The samples were divided into three groups (with five samples in each group). Five samples were kept untreated and served as control (group A). Another five plasma samples were sprayed for nitrogen ion implantation on their surfaces (group B) and the last five samples were pre-etched with acid before plasma treatment (group C). All the investigated samples were immersed for 7 days in Hank's balanced salt solution (HBSS) which was used as a simulating body fluid (SBF) at pH 7.4 and 37°C. HBSS was renewed every 3 days. The different surfaces were characterized by X-ray diffraction (XRD), Atomic Force Microscopy (AFM), Scanning Electron Microscopy (SEM), Energy-dispersive X-ray spectroscopy (EDXA), and Fourier Transformation Infrared Spectroscopy (FTIR). 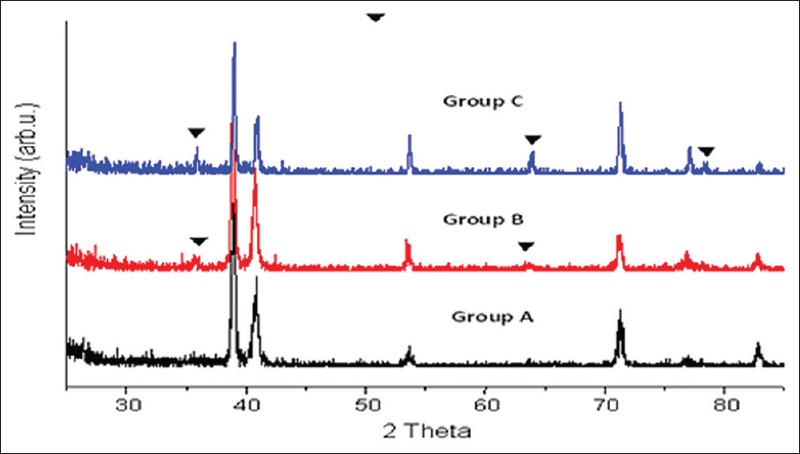 Results: Nitriding of Ti-alloy samples via plasma nitrogen ion implantation increased the bioactivity of titanium. Moreover, the surface topography affected the chemical structure of the formed apatite. Increasing the surface roughness enhanced the bioactivity of the implant material. Conclusions: Nitridation can be exploited as an effective way to promote the formation of bone-like material on the implant surface. Background: Toothbrushes in regular use can become heavily contaminated with microorganisms, which can cause infection or reinfection. There is a need for toothbrush disinfection methods, which are rapidly effective, cost-effective, nontoxic, and that can be easily implemented. Aim: To compare the efficacy of 3% neem, garlic of concentration 4.15 mg/mL and green tea of concentration 40 mg/mL with 0.2% chlorhexidine mouthwash as toothbrush disinfectants. Materials and Methods: The study was a parallel in vitro comparative experimental trial conducted among 75 randomly selected boys aged between 18 years and 21 years. The subjects were divided into five groups, namely, Group I, Group II, Group III, Group IV, and Group V. They were provided with a new set of precoded toothbrushes and nonfluoridated tooth pastes. After 14 days of tooth brushing, the toothbrushes were immersed in antimicrobial solution for 12 h [Group I——distilled water (control), Group II——3% neem, Group III——garlic of concentration 4.15 mg/mL, Group IV——green tea of concentration 40 mg/mL, and Group V——0.2% chlorhexidine] and then subjected to microbial analysis to check the presence of Streptococcus mutans. The t-test and analysis of variance (ANOVA) were done using Statistical Package for the Social Sciences (SPSS) software version 16. 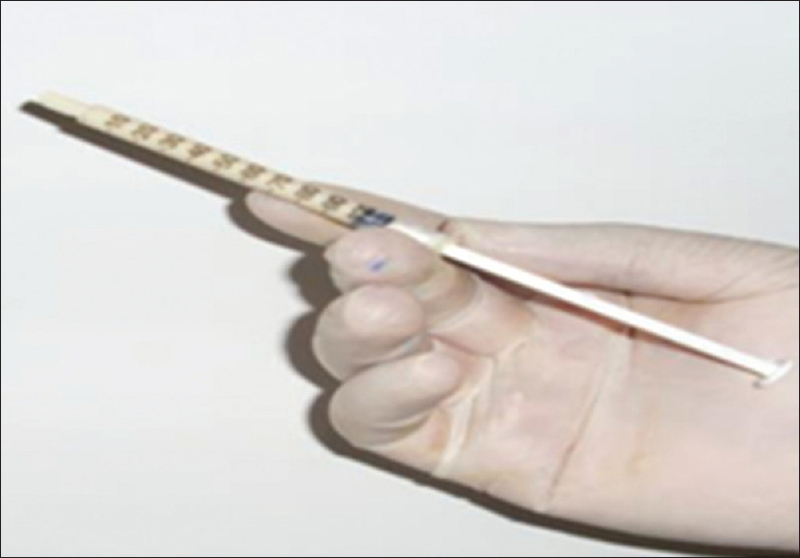 Results: All test solutions showed a statistically significant reduction of Streptococcus mutans count (P < 0.001). There was no statistical difference between the efficacies of neem, garlic, and green tea when compared with chlorhexidine mouthwash (P > 0.05). Conclusion: Neem, garlic, and green tea are equally efficacious as chlorhexidine and these herbal products can be used as potent alternatives to chlorhexidine as disinfectant for toothbrushes. Aim and Objectives: To determine the prevalence of developmental defects of enamel in children aged 12—15 years in Kollam district and to examine the etiological factors associated with the developmental defects of the enamel (DDE). Materials and Methods: A total of 2,500 children from 10 urban and 10 rural schools were examined using modified DDE criteria for recording enamel defects. Ten index permanent teeth were screened for the DDE. Results: The overall prevalence of the DDE was found to be 32% and the prevalence is higher in urban schools (34.3%) compared to rural schools (29.6%). The most common tooth affected by the defect was maxillary right lateral incisor (P = 28.6%) and the tooth least affected was maxillary right first premolar (P = 3%). The most common deformity was demarcated opacities (P = 28.76%) and the least common deformity was combination of diffuse opacities and hypoplasia and combination of demarcated, diffuse opacities, and hypoplasia (P = 0%). There was a very high significant association between DDE and the mothers' pregnancy age, illness during pregnancy for mother, medication taken during pregnancy by mother, prematurity of birth, intubation done during prematurity, birth weight, systemic illness during the first 5 years of life, intake of drugs or chemicals during the first 5 years of life, nutritional status, and trauma or infection on deciduous teeth and dental caries. Conclusions: The study population showed a prevalence of 32% and very high significant association between perinatal, natal, and postnatal etiological factors. It indicates the need for educating the population about the risk factors for the DDE. Aim: The aim and purpose of this study was to determine the occlusal fracture resistance of three core buildup materials using the Nayyar technique. Materials and Methods: Thirty human extracted maxillary premolars were used for the study. The test samples were decoronated till the cementoenamel junction (CEJ) and proper cleaning and shaping was done with protaper niti files till the F3. Corresponding f3 protaper(Dentysply)gutta pecha cones were selected and obturated. The gutta-percha was removed till the depth of 4 mm from the coronal orifice with Gates Glidden (GG) drills for all the samples; then the samples were randomly divided into three different groups. Group I was restored with universal composite Z350XT, group II was restored with light curable glass ionomer cement (GIC), and group III was restored with miracle mix. The coronal buildup was done using compound supported matrix. The fracture resistance strength of all the specimen groups was tested under a universal testing machine. Results: The data of the study were statistically analyzed by one-way analysis of variance (ANOVA) and Bonferroni's comparison test. Results of the study showed that group I that was restored with the universal composite Z350XT showed much higher fracture resistance strength compared to the other two groups. Statistically significant difference was noted between group I and group II and also between group I and group III. Conclusion: It can be concluded that the core buildup done with composite offered better occlusal fracture resistance strength compared to light curable GIC and miracle mix. Background: The smear layer has the capability to protect the bacteria within the dentinal tubules from intracanal medicament. After removal of the smear layer from infected root canals, it allows disinfection of the entire root canal. The smear layer compromising the seal between the root canal sealer and root canal wall also decreases the penetration of irrigants into dentinal tubules. Aims: This study compares the amount of phosphorous liberated and demineralization of the radicular dentin with 17% ethylenediaminetetraacetic acid, 10% citric acid and mixture of doxycycline, citric acid, and a detergent at different time intervals. Materials and Methods: Extracted maxillary single-rooted teeth were prepared by using a combination of passive step-back and rotary 0.04 taper nickel-titanium files. Sodium hypochlorite 5.25% and sterile distilled water were used as an intracanal irrigant. The canals were then treated with 5 mL of one of the following solutions such as final rinse sterile distilled water, 5.25% sodium hypochlorite, 17% ethylenediaminetetraacetic acid (EDTA) or mixture of doxycycline, citric acid, and a detergent. The presence or absence of smear layer and the amount of erosion on the surface of the root canal walls at the coronal, middle, and apical portions of each canal were examined under a scanning electron microscope. Statistical Analysis: Data were analyzed by one-way analysis of variance (ANOVA) to determine whether there were significant differences between the groups. Results: The results show that mixture of doxycycline, citric acid, and a detergent is an effective solution for the removal of the smear layer and does not significantly change the structure of the dentinal tubules. Conclusions: In this study, 10% citric acid shows the maximum amount of dimeneralization of radicular dentine followed by mixture of doxycycline, citric acid, and a detergent, and 17% ethylenediaminetetraacetic acid. When all the subgroups were compared, it was seen that the maximum amount of phosphorus liberation was performed by 10% citric acid >mixture of doxycycline, citric acid, and a detergent >17% EDTA at a different time interval. 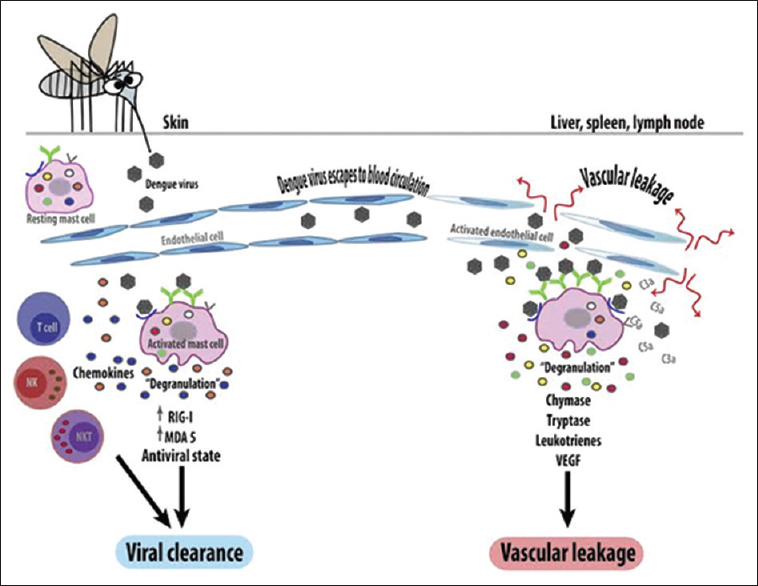 Objective: This study sought to assess the inhibitory effect of chitosan-containing sealants against Streptococcus mutans. Materials and Methods: The antibacterial activity of the resin sealant was evaluated by direct contact test following the addition of 0, 1, 2, 3, 4, and 5 wt% chitosan. At 3, 6, 9, 24 and 48 h, 1 and 3 months, 10 μl of the microbial suspension in contact with resin sealant was cultured to count the number of colonies. Data were analyzed by one-way one-way analysis of variance (ANOVA), repeated measures ANOVA, and Scheffe test. Results: The minimum inhibitory concentration of chitosan against S. mutans was 2 wt%. At 3 h, bacterial count in the presence of 2—5 wt% chitosan was significantly lower than that at 0 and 1 wt% (P < 0.05). However, this difference in bacterial count between 2 and 3 wt% chitosan and between 4 and 5 wt% chitosan was not significant. At 6 h, the difference in bacterial count between 3 and 4 wt% chitosan was not significant, whereas the remaining groups were significantly different in terms of bacterial count at this time (P < 0.05). At the remaining time points, significant differences were found between 2 wt% chitosan and higher concentrations (P < 0.05). Conclusion: Sealants containing 2—5 wt% chitosan show an antimicrobial property that is intensified by increasing the concentration of chitosan. Objective: Cell phones use electromagnetic, nonionizing radiations in the microwave range, which some believe may be harmful to human health. The present study aimed to determine the effect of electromagnetic radiations (EMRs) on unstimulated/stimulated salivary flow rate and other health-related problems between the general populations residing in proximity to and far away from mobile phone base stations. Materials and Methods: A total of four mobile base stations were randomly selected from four zones of Jaipur, Rajasthan, India. Twenty individuals who were residing in proximity to the selected mobile phone towers were taken as the case group and the other 20 individuals (control group) who were living nearly 1 km away in the periphery were selected for salivary analysis. 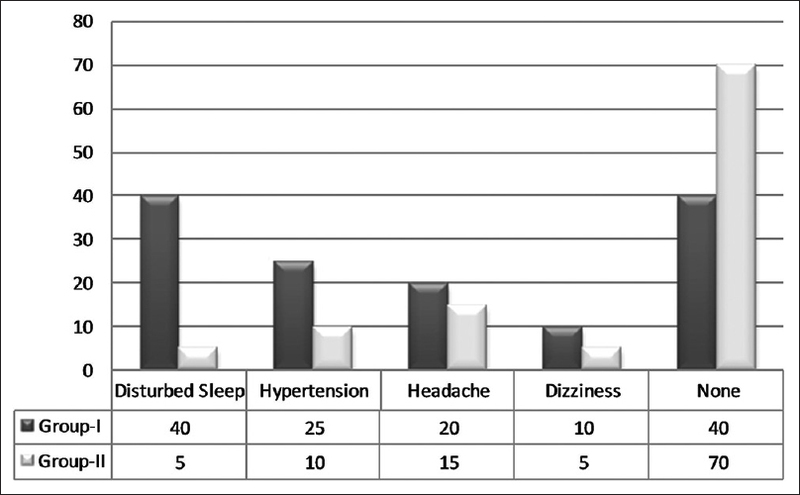 Questions related to sleep disturbances were measured using Pittsburgh Sleep Quality Index (PSQI) and other health problems were included in the questionnaire. Chi-square test was used for statistical analysis. Results: It was unveiled that a majority of the subjects who were residing near the mobile base station complained of sleep disturbances, headache, dizziness, irritability, concentration difficulties, and hypertension. A majority of the study subjects had significantly lesser stimulated salivary secretion (P < 0.01) as compared to the control subjects. Conclusions: The effects of prolonged exposure to EMRs from mobile phone base stations on the health and well-being of the general population cannot be ruled out. Further studies are warranted to evaluate the effect of electromagnetic fields (EMFs) on general health and more specifically on oral health. Background: The aim of this study was to investigate the oral health status and behavior of Greek dental students over time, and to meta-analyze these findings to test the widely documented hypothesis that women have better oral health behavior, oral hygiene, and periodontal status but higher dental caries rates than men. 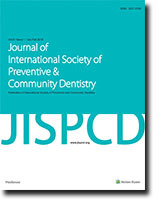 Materials and Methods: A total sample of 385 students was examined using identical indices to assess oral health and behavioral data initially in 1981 while the years 2000 and 2010 were selected due to significant changes that took place in the dental curriculum in the 1990s and 2000s. Data by gender concerning the outcome variables recorded in every one of the three surveys were analyzed using Mantel—Haenszel and continuous outcomes methods. Results: A significant improvement in the oral health status and behavior of students was observed over time. The meta-analysis of data by gender showed that females brushed their teeth significantly more often than males [summary odds ratio (OR): 1.95 and 95% confidence interval (CI): 1.08—3.54]. Males and females were found to have a similar risk of developing dental caries. Conclusion: The hypothesis that young women have better oral hygiene habits compared to men was confirmed. However, the hypothesis that women have better oral hygiene and periodontal status but exhibit higher dental caries experience than men was not supported by the findings of the study. Objectives: The present study was designed to evaluate the attitude toward mouthguard utilization among 8—11-year-old athletically active schoolchildren in Ludhiana, Punjab, India. Materials and Methods: A cross-sectional survey was conducted among 2,000 schoolchildren aged 8—11 years of both the sexes, attending private schools in Ludhiana, Punjab, India. Children were questioned about their perceptions regarding the protective role of mouthguards and the reasons behind not using mouthguards. The data were summarized and analyzed using the statistical software Statistical Package for the Social Sciences (SPSS) version 18.0. Results: The prevalence of mouthguard use was found to be only 4.25%. 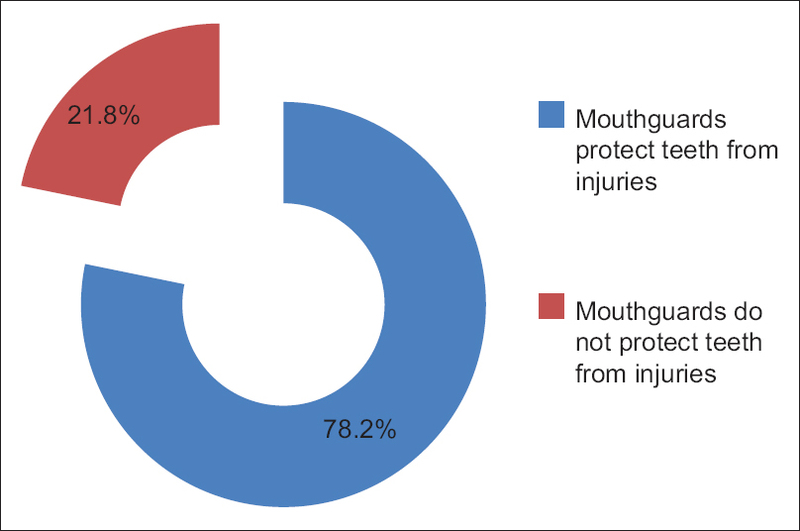 However, 78% of the children believed that mouthguards could protect them from injuries. On the other hand, a majority of the children using mouthguards (74.11%) said they would be willing to play without a mouthguard. Of the 85 children using mouthguards, 76 reported problems. Children using dentist-made mouthguards reported it to be expensive while the children wearing boil and bite mouthguards reported several other problems such as difficulty in speaking and interference with breathing. Conclusion: It was deduced that the usage of mouthguards in this age group was inadequate and dentists need to be targeted for recommendation of properly fitting custom-made mouthguards to the parents of susceptible children so that a positive behavior toward mouthguards is reinforced. Background: Enterococcus faecalis is a persistent organism that plays a major role in the etiology of persistent periradicular lesions after root canal treatment has been associated with different forms of periradicular disease including primary endodontic infections and persistent infections. The present study compares the antibacterial activities of calcium hydroxide, calcium hydroxide mixed with silver zeolite, and calcium hydroxide mixed with 2% chlorhexidine against E. faecalis using direct contact test. Materials and Methods: The test materials of the in vitro experimental study were grouped as group 1—calcium hydroxide mixed with sterile water, group 2—2% silver zeolite added in calcium hydroxide mixed with sterile water, and group 3—calcium hydroxide mixed with 2% chlorhexidine. The bottom of microtiter plate were coated with freshly mixed tested material and a 10 μL of bacterial suspension was placed. After 1 h of incubation at 37°C, brain—heart infusion (BHI) broth (245 μL) was added and mixed for 2 min. These were designated as “subgroup 1” wells. A volume of 15 μL of broth then transferred from subgroup 1 wells to an adjacent set of four wells containing fresh BHI medium (215 μL); these wells were designated as “subgroup 2”' wells. The optical density was measured by a spectrophotometer after the first day, third day, and seventh day. One-way analysis of variance (ANOVA) and Tukey tests were performed for the analysis. Results: Calcium hydroxide mixed with silver zeolite showed maximum antibacterial activity. Conclusion: Silver zeolite can be added in calcium hydroxide to enhance the latter's antibacterial activity against E. faecalis. Black hairy tongue (BHT) is a condition characterized by the elongation of filiform papillae associated with a marked discoloration, from yellowish-brown to black, and a thick lingual coating. BHT is usually observed in the elderly and in patients with limited self-sufficiency, as a consequence of poor oral hygiene. In this perspective, the patients affected by amyotrophic lateral sclerosis (ALS) represent a high-risk category for the occurrence of BHT. The fast and inexorable loss of their self-sufficiency due to progressive muscle atrophy as well as the impropriate education of healthcare assistants have demonstrated to have significant reflection on the maintenance of an adequate standard of oral hygiene. This paper firstly described a case of BHT in a patient affected by ALS. A case of BHT in a patient (Caucasic, male, 63 years old) affected by ALS was described. The primary goal of the work was to teach and motivate the patient to the use of the tongue cleaner in association with the local application of chlorexidine 0.20%. Furthermore, in order to support the patient with accurate domiciliary oral hygiene, a proper training for his health-care assistant was provided. The maintenance of the oral health of ALS patient is fundamental to prevent systemic complications that could jeopardize the already fragile physical balance of these patients. The dedicated monitoring by a dentist or a dental hygienist would seem essential in order to achieve this objective. Odontogenic keratocysts (OKCs) may occur in two different forms, either as solitary (nonsyndromic OKCs) or as multiple OKCs (syndromic OKCs). Multiple OKCs usually occur as one of the findings in Gorlin—Goltz syndrome with other features such as skin carcinomas and rib, eye, and neurologic abnormalities. We report a rare case of Gorlin—Goltz syndrome in a 20-year-old male patient who presented with a slow growing swelling on lower right and left back teeth region since 2 months. Apart from these, other findings were frontal bossing, depressed nasal bridge, ocular hypertelorism, prominent supra orbital ridge, and mild mandibular prognathism. Excision was done and microscopic study revealed OKC and the follow-up could not be carried out for the complete management. We also presented a review of its pathogenesis, criterion, and differences between syndromic and nonsyndromic OKCs and suggest to thoroughly examine any patient who presents with multiple OKCs to rule out syndromic variety.